It’s been a long time since we’ve seen an racing enigma at the level of Bayern, the Breeders’ Cup Classic champion. Bayern is a very good, perhaps great horse, that has been consistently misvalued by the public. Since June, he’s won 4 Graded Stakes at three different distances — but, surprisingly, in none of his wins was he the favorite. 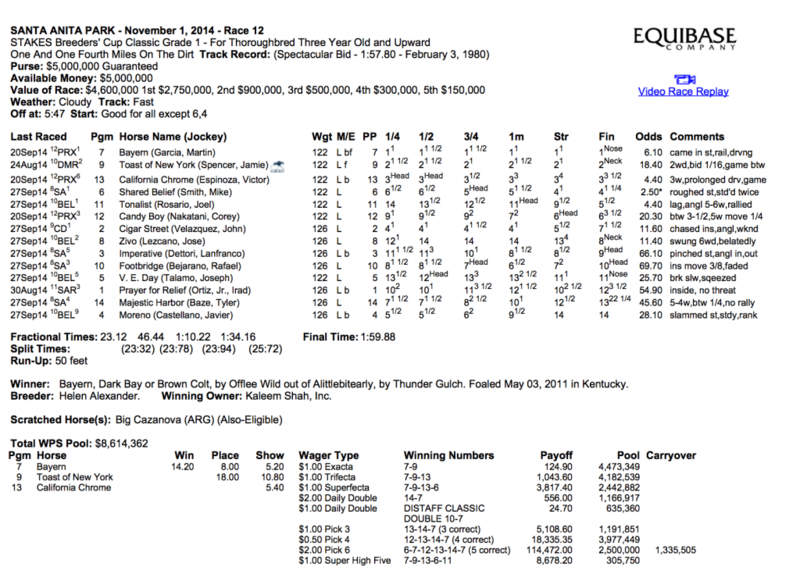 3 of these wins were by over 5 lengths. His campaign is a tale of overreaction to recent events, along with a bit of public stubbornness. I picked him to win in the Classic and didn’t like him at all in the Travers, but, just like most, I also missed him on several occasions. I don’t know whether he’ll win the Horse of the Year award, but he might just be the pari-mutuel horse of the year. 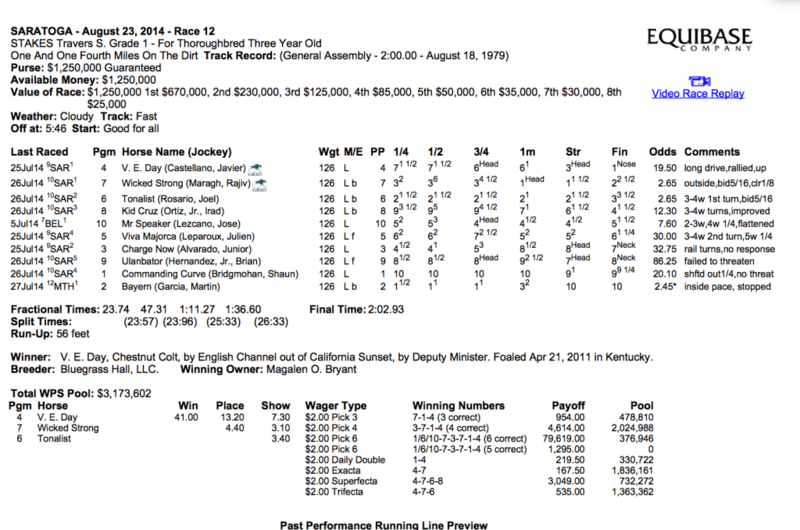 Here’s his PP’s on the eve of the Classic, which he won at 6-1 odds with a career-best Beyer Speed Figure of 113. Let’s take a look back at his campaign, starting with his first official graded stakes win in the Woody Stephens. I’ve included charts and videos, along with potential reasons for the pubic mistakes. Public Mistakes: Overweighting the Preakness effort, which now appears to be an aberration and, perhaps, too much too soon. Very hard for public to look past a bad last race. Overrating Social Inclusion and Havana, which had strong efforts in their past. 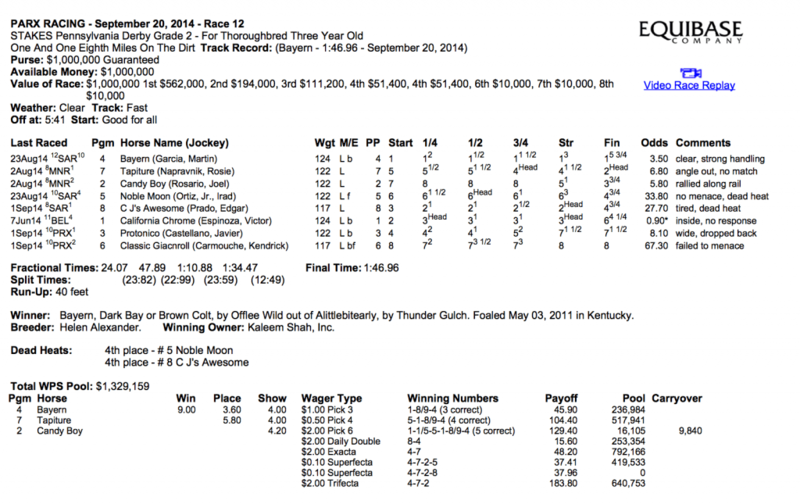 Baffert also excels at the cutback, which was the original plan with Bayern for the Haskell/King’s Bishop. 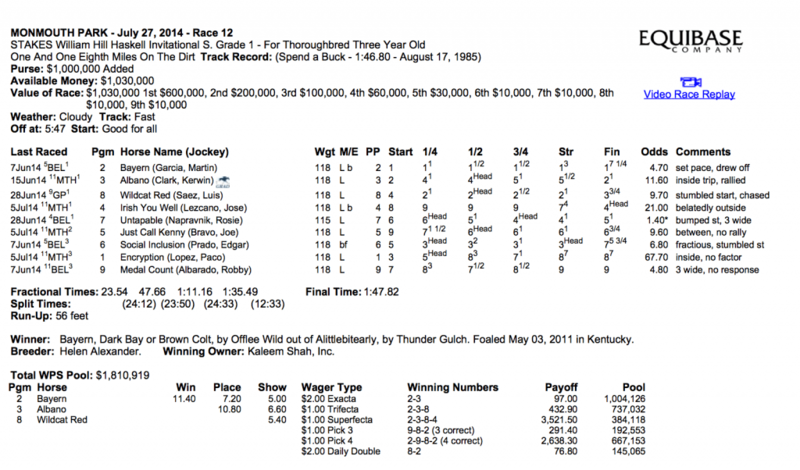 His next race was in the Haskell Stakes, where he faced a very good filly and eventual Distaff winner in Untapable. Public Mistake: Concern that Bayern was a sprinter/miler. Not fully considering track profile of Monmouth and Haskell history, which both favored Bayern. 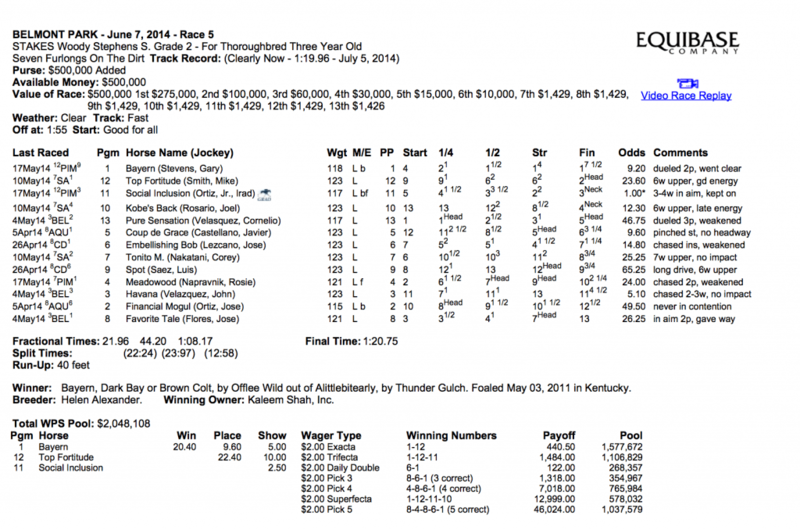 Overrating Untapable’s chances against the boys. His next race was the fast turnaround and unplanned attempt at the Travers. The original goal was another Route-to-Sprint into the King’s Bishop, but the connections seemingly got a bit of Travers’ fever after the Haskell. Public Mistake: The public actually got behind Bayern at the Travers, but once again, he proved elusive. Importantly, the public explained the loss based on two reasons — the early pace challenges and the 10 furlong distance. However, it is likely that it was the fast turnaround as Bayern’s other races provide no support for this conclusion. Finally, the Haskell/Travers double is difficult, especially when it’s an audible. After the Travers’ disappointment, Bayern next went to the Pennsylvania Derby, which really should be a Grade I, and will be in the future. 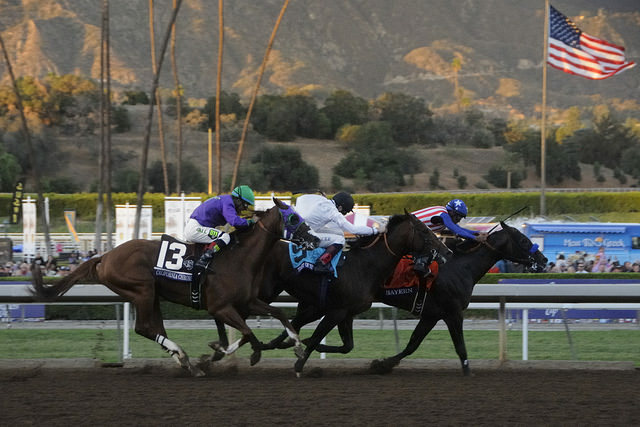 Public Mistake: Overrating California Chrome off the layoff. Huge bias at Parx favoring early speed gave Bayern a huge advantage. Public Mistake: Distance was a major concern going into the race, based off of Bayern’s Travers effort. The public also downgraded his Haskell and PA Derby wins, as bias-aided. There’s also the issue of the inquiry, but the public was nonetheless wrong on Bayern’s chances to perform very well in this race. In sum, there has been several reasons for the consistent opportunities that Bayern has generated throughout the summer and fall. The public often reacted to his last race and drew too strong of conclusions. After his Woody Stephens, the public saw him as a sprinter/miler and not a horse who can get classic distances. The public then overreacted to his Haskell victory in the Travers, but then appeared a bit hesitant when presented with an eerily similar situation to the Haskell in the PA Derby. The Travers created further opportunity by pushing two incorrect beliefs — Bayern can handle a pace battle and can’t get 10 furlongs. The public held to these explanatory beliefs stubbornly — and also likely believed that it was the bias, as opposed to talent, that aided this horse. Finally, it should be noted — and definitely not underestimated — that he often had the luck to face several favorites that were likely misvalued by bettors before the race, namely Untapable, California Chrome (in PA Derby), and Social Inclusion, which helped his prices throughout the year. Moving forward, I’m not sure that the public has figured out Bayern. I still hear concerns about distance, and the Classic win is viewed as illegitimate by some. I fully expect him to continue to offer value throughout 2015. Image: Scott Abelmen, Copyright 2014.